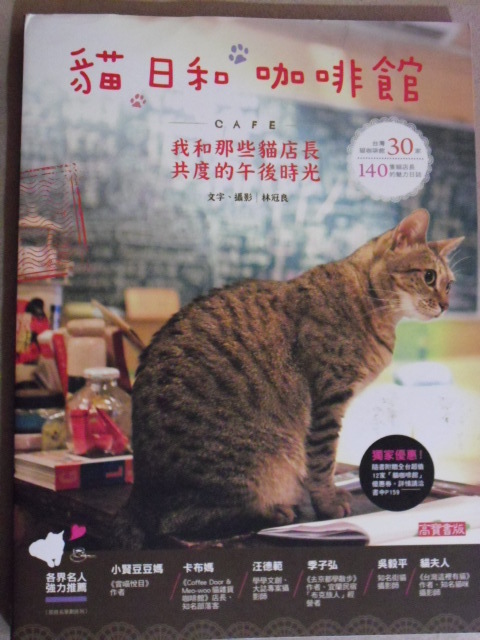 This book, found in the Eslite chain of bookstores around Taiwan and also available online, provides a list of cat cafes in the Taipei area. It also includes a few in Taoyuan and Hsinchu. For each cafe, it has beautiful pictures of the shop and of each cat. It provides a profile for each of the cats listing its name, age and whether it is male or female. Shop hours and average cost per person are provided. There are also coupons for several of the cafes in the back of the book. Unfortunately, they all expired in September 2011. 這本書, 在成品書店還有在網路, 有很多貓咖啡館的資料. 大部分是在臺北附近, 但是還有一些在新竹, 桃園. 書裡面有很多可愛的照片, 介紹每店的貓咪. 有地址, 開業時間 (可是因為這本書2011出版, 現在好幾個店有關掉或許改變.